How sweet is that? And if you're not reading her blog then . . . well . . . just read it because she's really funny and nice and takes the most amazing photographs! And so now, of course, I can't just sit back and beam because someone likes my blog, oh no, not me. Now I feel pressure. A sort of performance anxiety so to speak. Like I need to come up with some really great blog posts, pronto. But the truth is, I got nothing. Is that even possible you might ask? Why, yes. Yes it is. And I should know since I'm currently experiencing one having seen more movies in the last few days than I have all year. A few them watched in the comfort of my own home, and a few in an actual theatre, including not one but two separate viewings of TWILIGHT, one being the infamous midnight showing with Jessica Brody where we sat so close it felt like my eyeballs were on fire. And the second in a nearly empty matinee with my husband (yes, he truly is a saint. And no, I can never repay him for the sacrifices he makes.) all because I wanted to see it from a normal perspective in a seat that didn't require me to contort my spine, crane my neck, and pray for the safety of my retinas. And then yesterday, we saw QUANTUM OF SOLACE, which I didn't like near as much as CASINO ROYALE, but it was still fun in a drool worthy, white knuckle, 007 kind of way. And now all I can think is: Which movie next? Because I've got a feeling that the only way to cure this particular hangover is another popcorn fix. Any suggestions??? Which movies make your must see list?? In honor of Black Friday-- (that massive shopping free for all I've no plans to partake in, choosing instead to stay tucked away in my home office, working on the third book in my upcoming THE IMMORTALS series, which I fondly call, UNTITLED BOOK #3)-- I thought I'd write a bit about shopping. Or more specifically-- Holiday Shopping. Which officially starts today. And they don't even have to be my books (though they do make good gifts!) --anybody's books will do! Books are a gift you can open again and again! Brilliant, huh? But I didn't make that up, so please send all kudos to Meg Cabot- who, as you know, also writes books! other book related type item. And it's not just because in these tough times a good book is one of the quickest, most economical, ways to escape (though as far as reasons to purchase--that's a pretty dang good one! ), but because a really good book is something to cherish, to share, to blog about, and to highlight passages and earmark pages you want to read again and again. A good book will teach you something you didn't know, make you think about something that never occurred to you, allow you to travel somewhere you've never been, and make you experience something - exciting, scary, romantic, thrilling, funny, or sad- in the safety of your own home--hair salon- coffee shop--backseat-park bench-or wherever it is that you like to curl up and read. So go ahead, add a book, or two, or ten to your give and get list-- and then tell me, what books are on your list this year?? Okay, I'm just gonna go out on a limb here and admit to something you may find shocking. Ready? I've never been big on Thanksgiving. There. I said it--and I feel so much better now that I've confessed. And just to illustrate this point even further, a long, long, (okay veeeery long time ago) my mom spent an entire Thanksgiving waiting for this particular butterball to drop, but I held my ground and refused to be born until December 3. So as you see, I have a long and storied history with this particular date. 1. My amazing husband who not only serves as my best friend, legal advisor, personal gourmet chef, bad mood eraser, silver cloud chaser, comic relief, tireless proofreader, one man cheering section, tech support, (the list of things he does for me is endless! ), but who just so happens to be, the smartest, nicest, most amazing person I've ever met! 2. The City of Hope. In particular, the amazing Dr. Foreman, who saved not just my husband's life, but my sister in law's too. 3. My readers- you guys are THE BEST! Seriously, awesome. And your letters and e-mails and posts to my bulletin board mean more to me than you could ever imagine. 4. My incredible agent, editor, and publisher-- I couldn't do it without them! 5. My family immediate, extended, the entire clan! Their love, support, and enthusiasm knows no bounds. 6. My mom in particular for showing me the moon at a very young age and encouraging me to shoot for it! 7. My friends, near and far-- you know who you are! You guys ROCK! 9. Hope. And Change. And the belief in better days to come. 10. And lastly, I'm grateful to live in a place and time where anything is possible! PS- What are you thankful for?? It was truly a blood sucker weekend! What with the Twilight Midnight Movie Going Madness to the season finale of True Blood--it seems like my entire weekend was hijacked by the undead! And rather than posting a Twilight Movie Review, partly since I'm not so big on reviewing stuff, but mostly because you probably already saw it and have drawn your own conclusions by now, I thought I'd post a Twilight Movie Goer Review--as in the hundreds, maybe even thousands--who knows?--of teens (mostly girls, though there were a few smart young men there as well--I mean, hello? A theatre filled with cute young girls- it should be a no brainer, right?) who lined up hours ahead of time to watch the 12:01 am showing of Edward and Bella. The theater I went to in Aliso Viejo showed it on five screens simultaneously, and since Ms. Brody was smart enough to purchase advance tickets online, I thought our 10:45 pm arrival would get us a decent place in line, along with pretty okay seats--wrong! We ended up standing in the alley, waaay behind the theatre, the very last ones in line until a really nice mom showed up behind us. And once inside it was third row center--great at a concert--not so much in a theatre! And while the movie was entertaining (it has it's flaws, yes, but still it was fun), and Jessica was rewarded for her vast knowledge of all things Edward and Bella by winning a Twilight T-shirt for correctly answering that Bella ate mushroom ravioli on her first date with Edward, the very best part for me was chatting with the three girls who stood in line in front of us, and who ended up sitting in front of us in the theater as well, and the whole crowd in general. To see that many people get so excited over characters from a book (yes, I missed out on the entire Harry Potter mania never having read any of the books--gasp! And only seeing one of the movies, well past its release date), wearing their Team Edward and Team Jacob T-shirts, and squealing every time a new character came on screen was truly amazing! And a $$$70.5 million dollar opening weekend fueled almost entirely by teen girls is a site to behold!!! Never underestimate the power of girls! Did you see the movie? If so, what did you squeal when Edward came on screen?? How I spent my Thursday . . . Waiting for midnight . . .
As if it wasn't enough that I buy ELLE pretty much for the astrology and numerology sections they print in the back of the magazine-- now there's THIS. Yup, you read that right- a fun little tool combining your astrological birth sign with-- er-- color! And with a December 3 birthday my color is "celestial" (it's a blue tone). Then come back to post your results if you want! 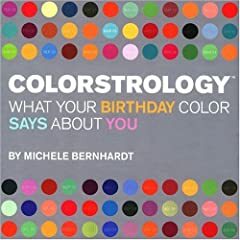 And if that leaves you wanting more then go HERE to buy the Colorstrology book! Special shout out to the very awesome Lamia who finds the most amazing thing on the net and blogs about them way before me!! Thanks to the ever industrious Ms. Jessica Brody, I am now an official ticket holder for TWILIGHT's opening night!! And even though I haven't read past NEW MOON yet, I totally cannot wait to see Edward on the big screen! And speaking of Jessica Brody, be sure to stop by her awesome sites FREE BOOK FRIDAY and FREE BOOK FRIDAY TEENS for your chance to win a signed copies of Amanda Ashby's YOU HAD ME AT HALO and Melissa Walker's VIOLET IN PRIVATE! Hurry--the contest closes on Friday! 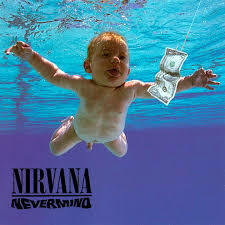 Also, ever wonder what happened to the naked baby on Nirvana's iconic NEVERMIND album cover-- (come on, you know you've been wondering!) -- well wonder no more! He's all grown up now having reached the ripe old age of (gasp!) 17-- and he's recreating his most famous pose --albeit with swim trunks this time! To see the pic and read about his no fail pick up line (I seriously hope it fails more than it works! )- click HERE. So tell me, are you planning to see TWILIGHT the movie?? Yay! Khyrinithia, aka- The Frenetic Reader likes EVERMORE!!!
" . . .I found myself unwilling to put the book down, even though I had to at some points, because I wanted to know what was going to happen with everyone and see how all the little subplots would be woven together. Also, Alyson Noel knows how to write her characters. Ever was so real and her emotions were so believable that it was a little creepy. It's like Alyson Noël is actually a grieving, lovestruck teenager. She got Ever completely perfect. And by perfect, I mean delightfully flawed and deep. Also, I'm kind of smitten with Damen even though he got on my nerves a lot. He's fascinating to read about because of his past. Love him. Alright, since I know nobody went and preordered this before reading the review, you better go do it now. You're really going to want this one. I swear. It's a great start to the series, especially considering that the ending isn't a big cliffhanger but still leaves you wanting more. (Well, actually me since I've read it. You just sounds better. But once you read it you'll want the sequel. Trust me.)" Also, congrats to the winners of the Last Two EVERMORE ARCs over at Free Book Friday Teens, make sure to check back tomorrow for more chances to win! Seriously, this is your LAST CHANCE!! This is it, your very last chance to win one of the very last two EVERMORE ARCs!! So if you haven't signed up at Free Book Friday Teens yet-- be sure to do so soon! The winner will be chosen on Friday! Oh, and then check back to Free Book Friday Teens on Saturday for more awesome giveaways! It's official! I've just agreed to write three more books in my upcoming Immortals series for St. Martin's Press--making for a total of five!! The first book, EVERMORE, is scheduled to drop on 02.03.09, the second book, BLUE MOON, will be in stores in fall of 09, and the following three will be published in 2010!! And I'm so excited I would totally celebrate-- but I really should be writing instead! Be sure to check back in December though--I've got an exciting new website makeover planned!! If you vote, Starbucks buys your coffee!!!! More reasons to get out there and ROCK THE VOTE!!! The Cupcakery, which just happens to be one of my must visit spots whenever I'm in Vegas (along with the Primm outlet stores! ), is giving away a FREE CUPCAKE to anyone who shows up at their Texas location with an "I Voted" sticker. Seriously, all you have to do is vote and one of their amazing cupcakes is yours! You can read about it HERE! So come on Texans, do it for democracy, do it for the cupcakes! My husband and I have OCED (obsessive compulsive election disorder)- a very serious condition ruled by 24/7 election coverage (CNN in the car anyone? )- with only one cure- November 5th. And as eager as I am for Wednesday- I've no idea what we'll do with ourselves when it comes (besides celebrate-hopefully!). Surely we used to discuss other topics, watch other channels, but it's been so long, I can barely remember . . .
We voted absentee two weeks ago- the decision was easy, there was never a choice. And while I missed actually going to my local polling place and getting my "I VOTED" sticker, it was nice to check the box in the comfort of my own living room. Heck, it was nice to have the opportunity just to check the box. Eighty eight years ago that wasn't the case. Which is why it's so important to vote. To take the time to register your voice and be heard. If the lines are long bring a good book, start a conversation, listen to you iPod, whatever- Just get out of your house, over to your polling place, and do it! Apathy is the enemy of democracy--and this is the most important election of my lifetime--and quite possibly yours! So while I won't tell you who to vote for (though believe me, I'd love to! ), please just get out and vote! Check your box and be heard! Exercise your right--and don't let anyone intimidate you or turn you away. And on Wednesday, November 5th, we'll look for new ways to distract ourselves. PS- And if you're not old enough to vote--feel free to bother those around you who are until they vote too!